A team of researchers at the Gene Editing Institute in Newark, Delaware, has successfully treated chemotherapy-resistant lung cancer cells with the CRISPR gene-editing technique. The study was published Dec. 21, 2018, in Molecular Therapy Oncolytics. In addition to making drug-resistant lung cancer cells treatable with chemotherapy, the approach offers the potential to improve quality of life for cancer patients. “In the broader sense, such an approach would ultimately lead to a reduced level of chemotherapy required to produce the same tumor-killing activity, leading to an improvement in the quality of life of a cancer patient,” the authors wrote. Although lung cancer was the focus of the study, the approach may also offer a new treatment avenue for mesothelioma. Many of the drugs currently in clinical trials for treating mesothelioma were studied first as lung cancer therapies. Researchers studying thousands of patient biopsies found high rates of chemotherapy resistance in lung cancer tumors. More than two-thirds of lung cancers are resistant to carboplatin. For example, resistance to cisplatin — a common mesothelioma treatment — is present in 63 percent of samples. Scientists have searched for ways to address chemotherapy resistance for years. Now they have identified a potential solution. 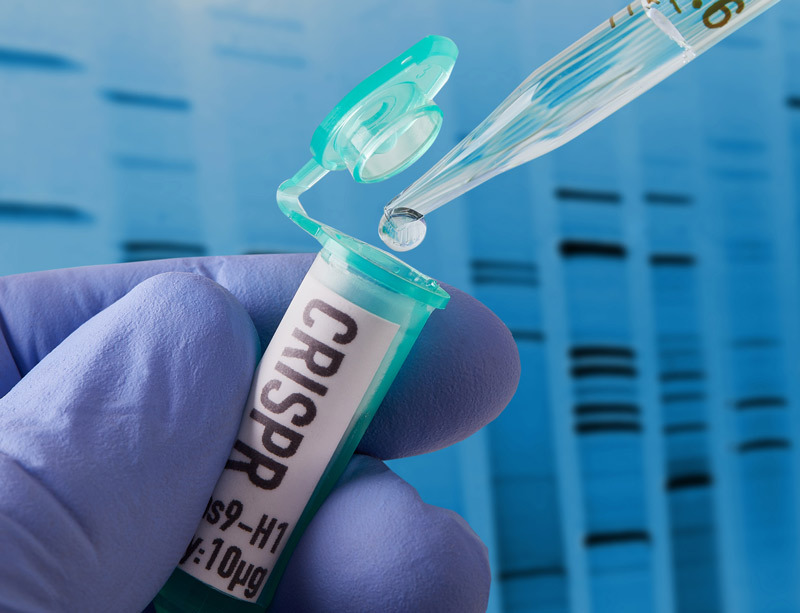 A large portion of CRISPR research has focused on treating genetic diseases by altering human genes. This new study focused on changing the genes of the tumor, not the person. Dr. Pawal Bialk led the team investigating the use of CRISPR to improve lung cancer treatment. The group targeted the NRF2 gene in lung cancer cells in the lab. NRF2 controls many other genes that allow cancer cells to develop resistance to chemotherapy. Using the CRISPR method, the team turned off the NRF2 gene in chemotherapy-resistant lung cancer cells. These are called knockout cells. The investigators then treated a batch of the genetically altered lung cancer cells and a batch of unaltered cancer cells with cisplatin. The unaltered cells continued to grow and multiply, even after being treated with cisplatin at increasing doses. Cell growth only slowed at the highest concentrations of chemotherapy. In contrast, even low doses of cisplatin halted replication of the genetically altered lung cancer cells. The scientists repeated the experiment with carboplatin and noted similar results. Study authors surgically implanted one group of mice with the genetically altered lung cancer cells. They implanted another group of mice with the unaltered cells. Researchers treated the two groups with cisplatin and the tracked tumor growth in the animals. This approach is especially promising because CRISPR allows manipulation of genes with more accuracy and precision than previous methods. CRISPR also offers a way to treat cancer without altering human genes, which raises fewer ethical concerns. “We believe that finding ways to use CRISPR to improve existing treatments will lead to some of the first benefits for patients while we tackle the vital ethical issues around the use of CRISPR for edits that can be passed on through DNA,” principal author Dr. Eric Kmiec told EurekaAlert science news. “This work is another significant step on the pathway to FDA approval,” Dr. Nicholas J. Petrelli, endowed medical director of the Helen F. Graham Cancer Center & Research Institute told EurekaAlert. This approach could be used to shut down any gene in any type of tumor, including aggressive cancers such as mesothelioma. d'Amato , T.A. et al. (2006, February). Prevalence of In Vitro Extreme Chemotherapy Resistance in Resected Nonsmall-Cell Lung Cancer. What is Biotechnology? (2019). CRISPR-Cas9: Timeline of key events.